It has been 12 days since Big Sis's summer vacation started. In these 12 days there have been picnics, movie at the theater(Judy Moody), umpteen library visits, one piano recital, friends staying over for one weekend and one sleepover. Only the sleepover did not culminate in sleep because it was Big Sis's first and she missed her little sis terribly. So around midnight we got her back. But other wise her sleepover was really fun because it started early in the morning and it was spent with a lovely 15 year old girl, whom BigSis adores. The 15 year old is the most perfect 15 year old I have ever seen in my life, why else would she agree spending a day and night with a 7 year old tell me ? On her day out BigSis picked up some great cooking too. Sleepovers with fifteen year olds come with lots of advantages, I tell you. Top it with the fact that it is delicious.Everyone who had it loved it and for this summer this is going to be on the menu when I am having people over until Big Sis rebels that is. But even then it is so easy that I can do it by myself. Help your child make it this summer too and you won't regret it for sure. In a square baking or serving dish arrange the graham crackers in a single layer. Break the crackers to fit in to the corners and edges. 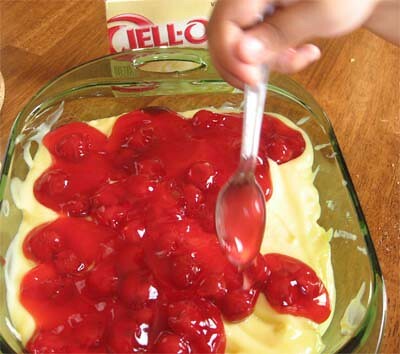 Using Jell-O instant pudding mix make a pudding. The instruction is right on the box but let me tell you here. To 2&1/2 Cup of cold Whole Milk add 1 box of Jell-O instant pudding Mix. Stir for 2 minutes. Do not wait for it to set. You have to use it before that. Once it is mixed pour half the pudding on the graham cracker layer. Smooth the surface and top it with one more layer of Graham Crackers. Pour the rest of the pudding on top of this layer. Top with a can of Cherry Pie filling. Chill in the refrigerator for at least an hour. Serve cold. Bacchader ki moja na? Amader keno summer vacation ... or any vacation ... hoye na? Khub colourful pudding ta dekhte hoyeche. Thats a delectable and irresistible pudding..
congrats! ur daughter became a cook. not only that, an excellent cook who can produce such beautiful looking dessert at the age of 7 yrs. she is far ahead of at least me at that age. The dish looks great,but u know I live in India and I don't think we get Graham crackers or Jell O pudding.Can you suggest some other substitutes. Khub shundor meye tomar - choto bonke eto bhalobashe aar already kichu ranna shikhche! She reminds me of my elder sister, who would run back from any trip and give me a big hug first thing because she missed me so much. Who can resist that beautifully prepared dessert? It sure looks great Sandeepa and be sure to tell big sis. So Big S is taking interest in cooking too!! This recipe is simplicity itself - no wonder she is so pleased with herself, and what a well behaved 15 year old to entertain her so well. the pic captures the easy cooking aspect of it all - when i saw it i knew it would be one of those easy-to-make things. That looks good. I'm going to ask my mom to make it for me and my dad. 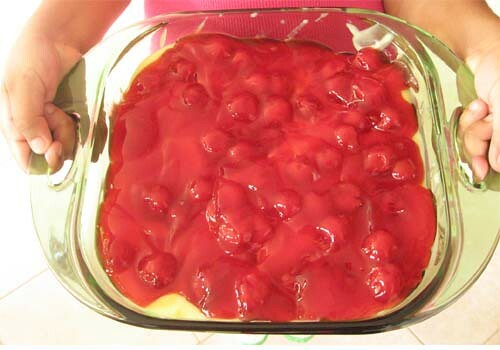 The Cherry Pie Pudding is soooo drool-worthy!Totally yum! 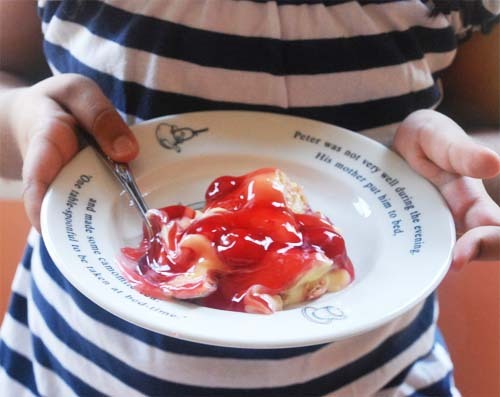 Isn't it lovely to have kids take an interest in cooking? That's why we at Women’s Web, have the “Cooking Is Child’s Play” contest going on. We are inviting all the talented cooks in the food blogging community out here to share with us kid-friendly recipes that can be prepared with the help of children. I’m sure you must have many interesting ideas! There are several exciting prizes to be won so check out our website for further details and do send in your entry! Contest closes Aug 1st. We hope to hear from you soon. Do share your experience & expertise with us! All the very best!